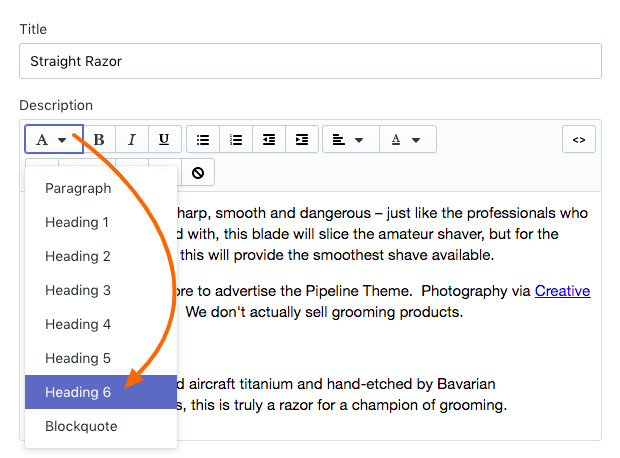 Here's an overview of product tabs and how to use them in Pipeline. 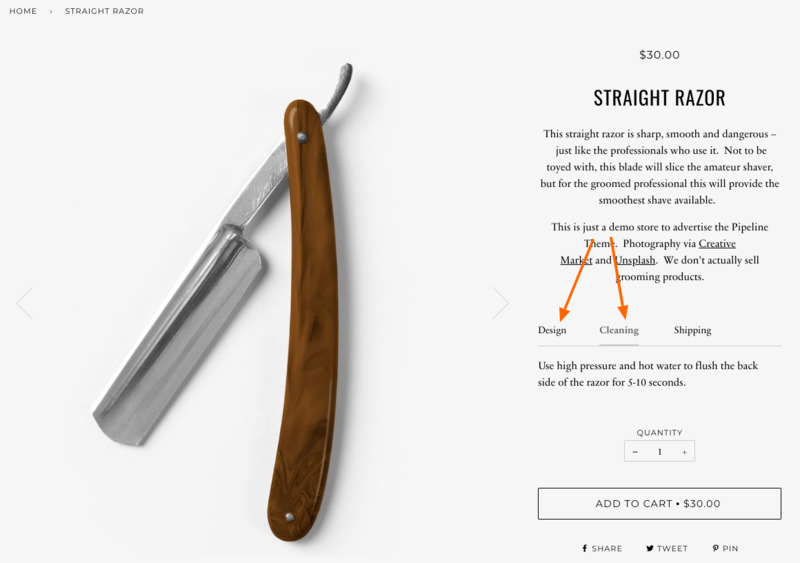 Tabs can be positioned on the right column with the product description or below the featured product image. There are two primary types of tabs - Shared tabs, also known as global tabs and unique tabs, also known as local tabs. 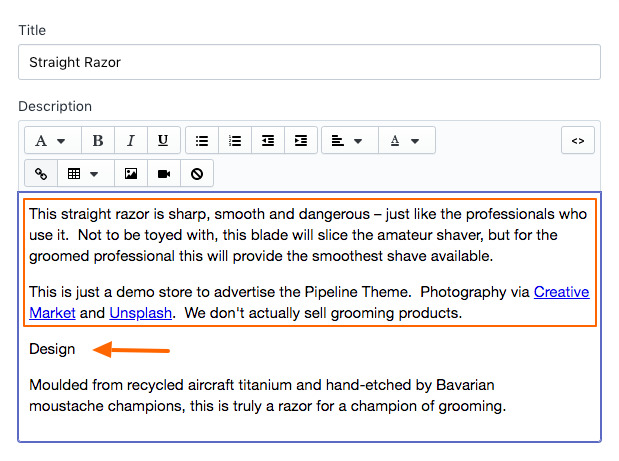 Global tabs are shared with all products and local tabs are unique to each product. 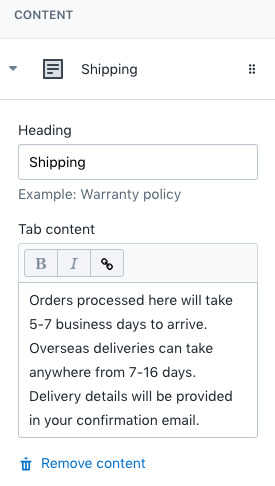 These tab features require that your theme version to be 3.0 or higher. 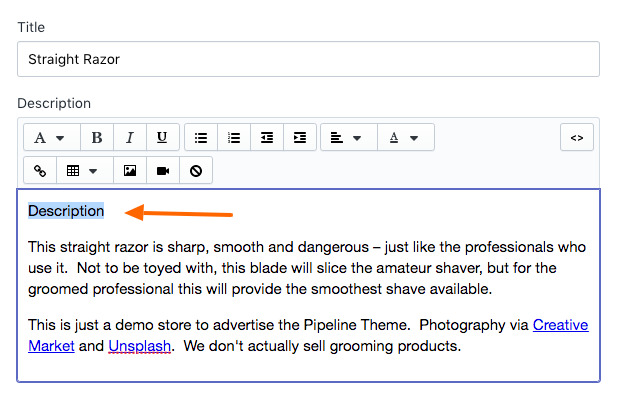 Earlier versions before Pipeline 3 will need to update to have the same functionality. Shared tabs are ideal for content that all your products will display. For example, shipping, taxes, returns and more. 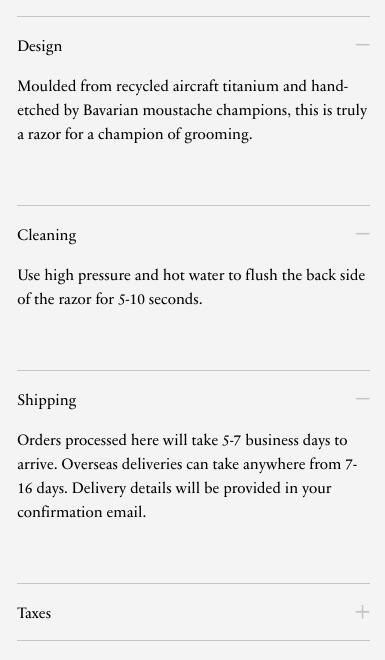 This allows you to add the information once and it's instantly displayed on all products. 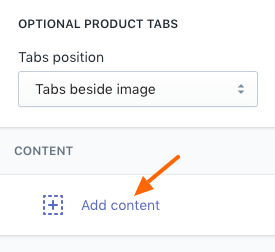 In the Content section, use the Add content block to begin adding tabs. Text tab is for simple content. 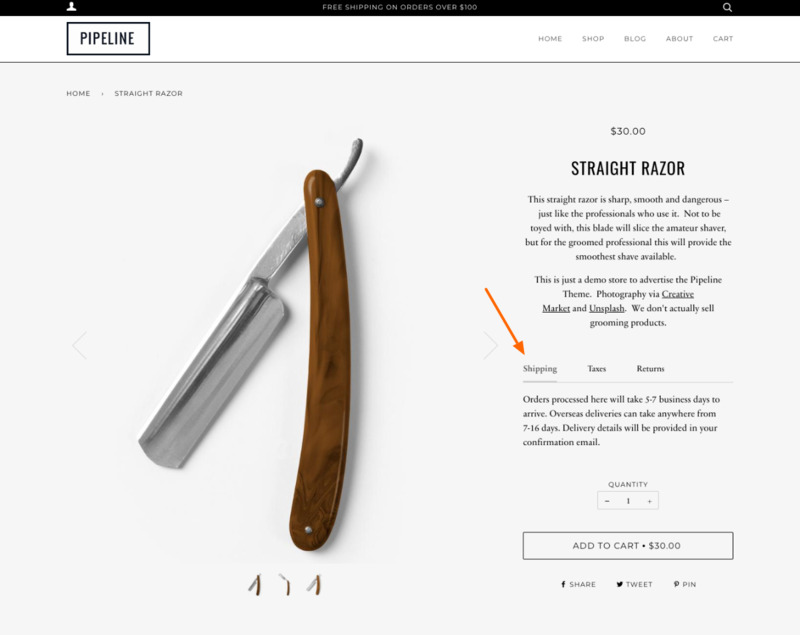 It uses the standard Shopify rich-text editor which allows you to bold, italicize without using any code. HTML tab is for richer content. 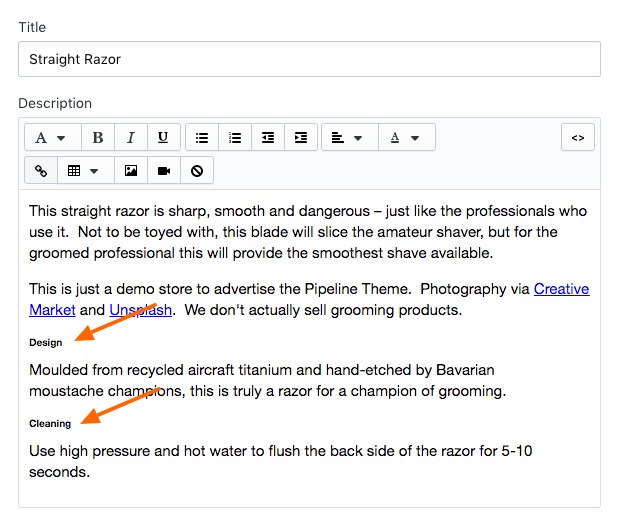 You can embed videos, add any standard html tags to style your content. Page tab is a unique and helpful tool. 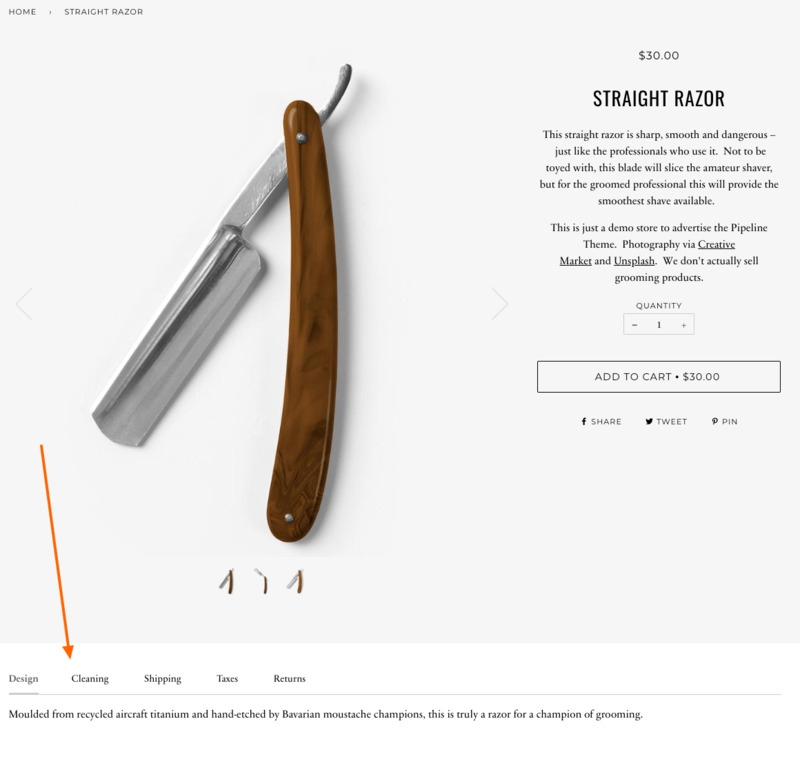 With a page tab, you can include an entire page that you've created into the tab. Add an existing page or make a new page with content just for the tab. 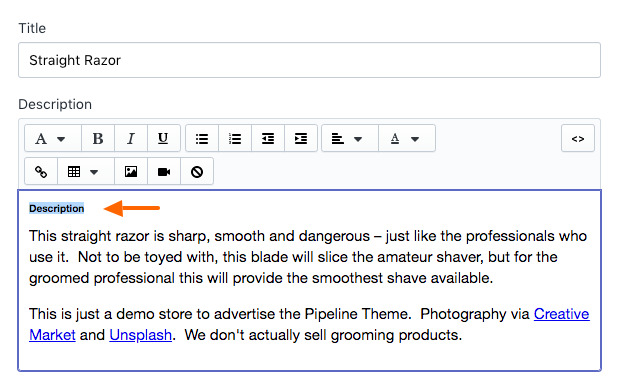 The page doesn't need to be shown elsewhere on your site. Description H6 is for adding unique content to product pages, that will be covered below. 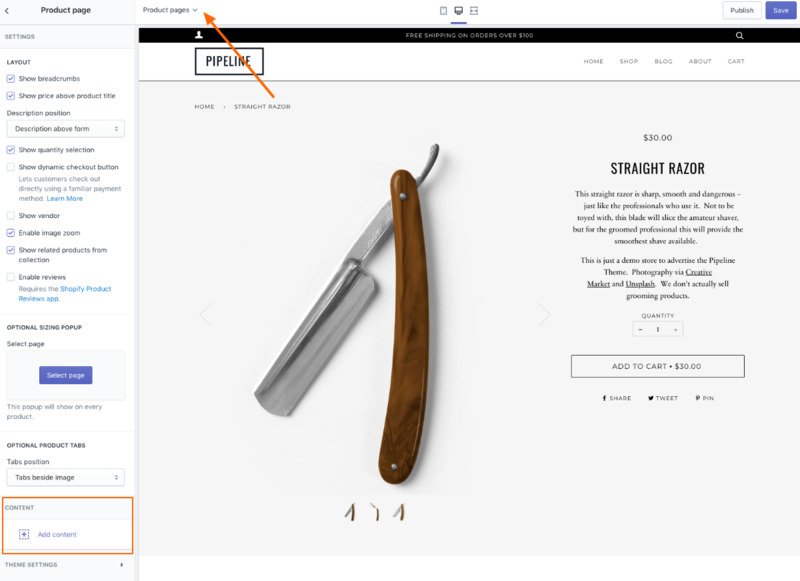 Tip: If you have a Shopify Page created for product sizes, you can use the Page tab type to display the entire page in a tab. 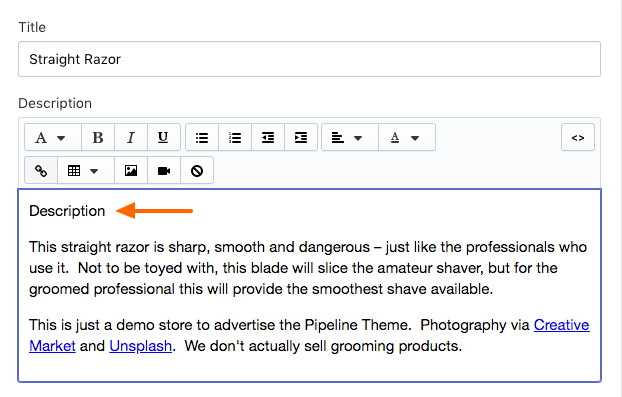 Since this will be shared with all product pages, be sure it includes sizing for all product types. 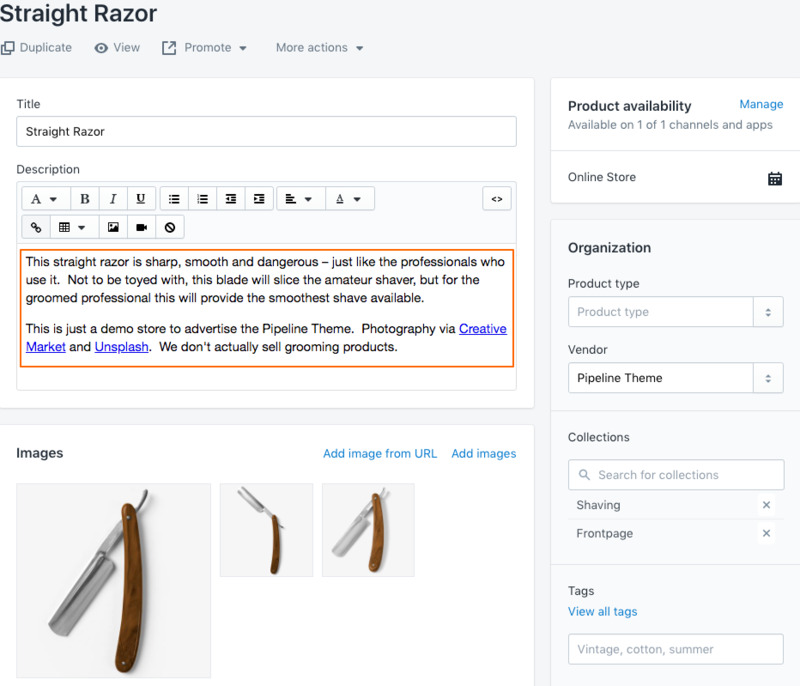 This tells the theme to look for H6 tags in your product setup which will then create unique tabs. 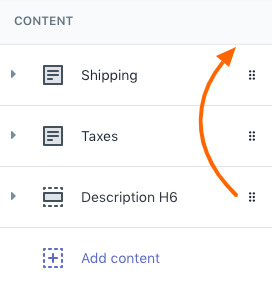 Add Description H6 in the content section to activate unique or local tabs. 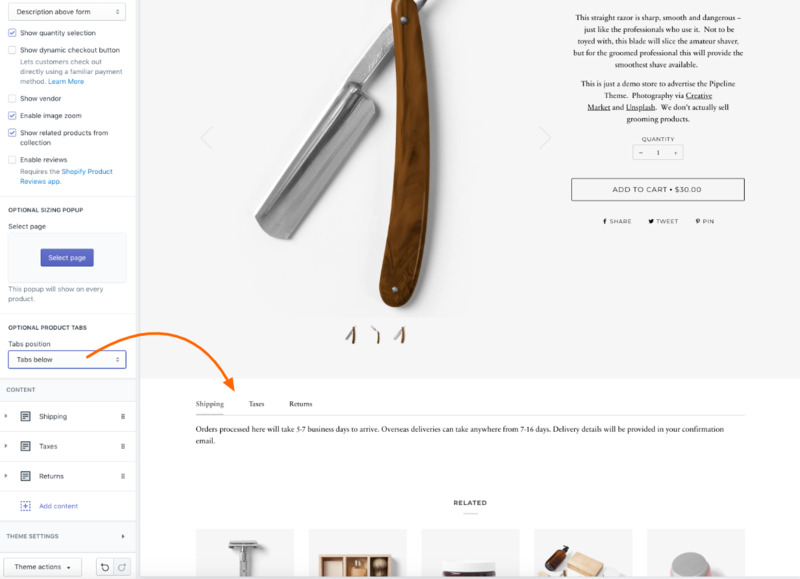 After adding the content block, the next step is done in your product setup. 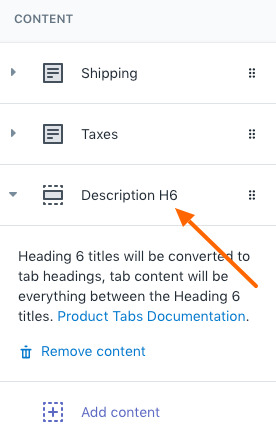 Now that we have activated Description H6 tabs, in our product setup we can use H6 tags to create a tab title and all content below will appear in the tab. If we're creating multiple tabs, we begin the next tab with another H6 tag. To move the entire description of this product into a tab, we can easily add a tab title to the start of the content. 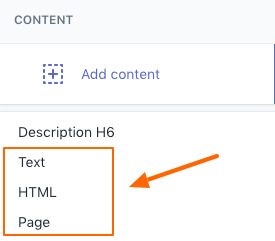 Tab titles need to have the <h6></h6> tags or use the Heading 6 font style. To sort tabs, in the Theme Editor use the handle icon which is on the right of each content block to drag and drop into position. 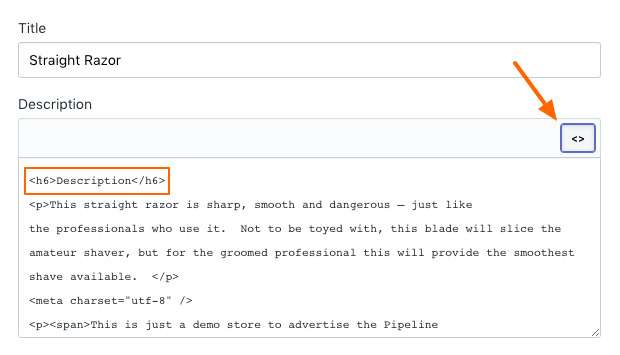 Always use clean tab title tags without any class or styles. 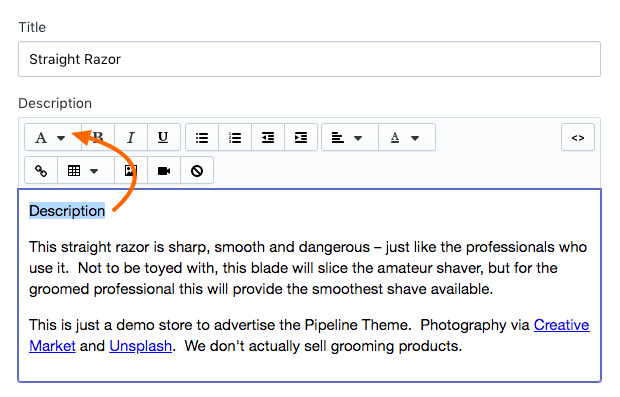 The added style in the in the <h6></h6> tags will cause formatting issues. 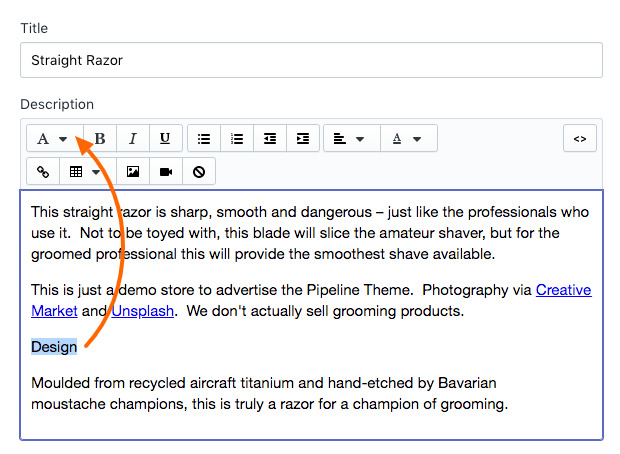 Clean out any extra styles you have in your markup to help fix tab and accordion issues. 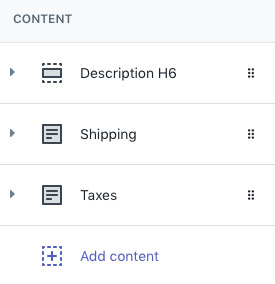 In the product setup, we can begin adding our Design tab title and content after the regular (original) product description. 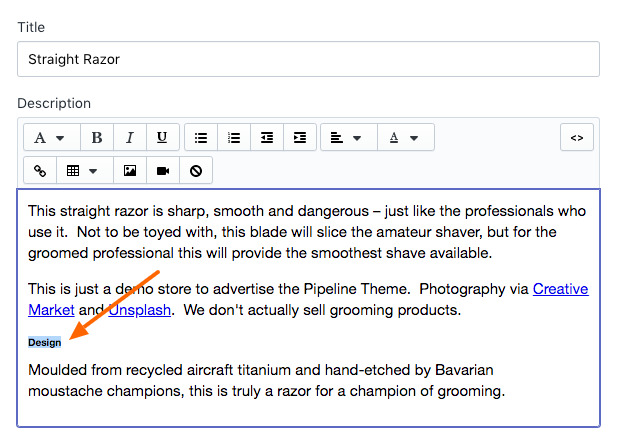 For this example, I've removed the description tab from the first example. Tabs should always begin after any content you want displayed outside of the tabs. 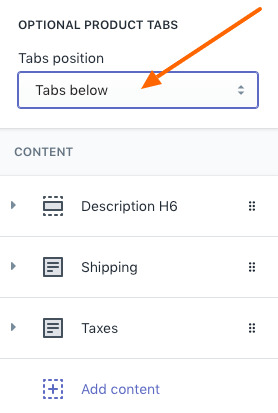 Start with the tab title (Design) followed by the tab contents. 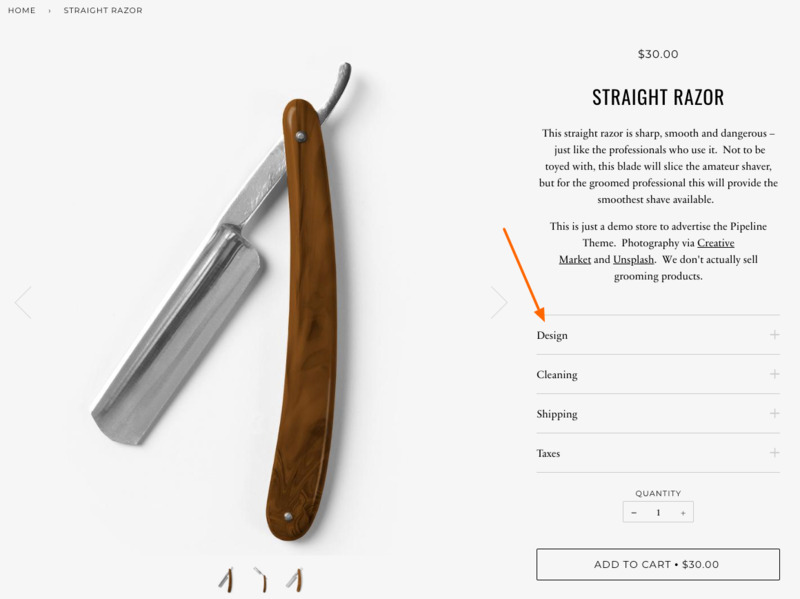 Since this has been added only to this product, the rest of your products won't display the Design tab, only the shared tabs. 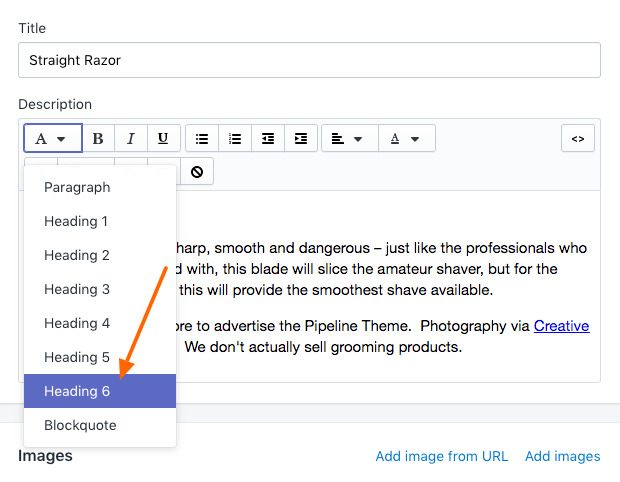 Each product can have their own tabs by using the Heading 6 format. Adding multiple tabs is simple once you understand how Heading 6 tabs are created. To add additional unique tabs, stack their content below each other in the product description. Be sure there is no content after your tabs. Regular product description content should reside above the tabs. 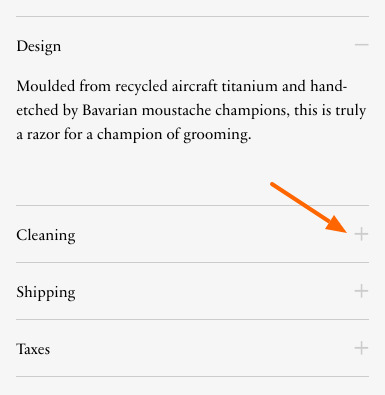 In the previous example, I removed Taxes to allow the tabs to fit in the right column. Once I added the tabs back, accordions were automatically created as there wasn't enough space to display the tab titles. Keep in mind mobile users have less space, accordions are usually displayed for mobile devices.